The Museum of the City of New York is a private, non-profit museum located on Museum Mile on 103rd Street and 5th Ave in the Upper East Side of Manhattan. It celebrates NYC, educating the public about the city's distinctive character by showcasing its history, culture and art, as well as its heritage of diversity, opportunity and perpetual transformation. Because the museum operates on a suggested donation model, it is highly accessible to the general public. However, since no admission cost is required, the gift shop is an important source of revenue. Currently, museum visitors enter through Store A (blue line), which also operates as a ticket counter. 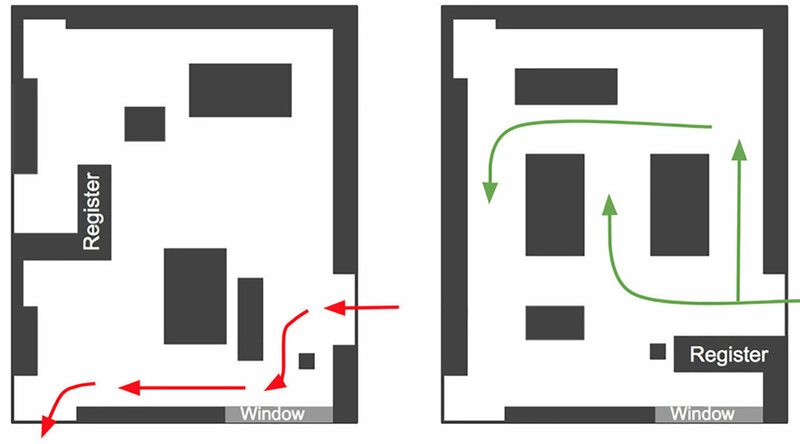 However, when visitors exit, they tend to go through a large inviting atrium glass door exit (red line), instead of the Store B (green line). More cashflow from the store will sustain the museum. Design signage and wayfinding to attract visitors to the Store B and pinpoint the types of items they want to see and buy once there. Optimize the flow of users upon conclusion of their visit to the MCNY. The photo below shows the exit options side by side. The atrium doors are what most customers use, which results in lost revenue for the museum. MCNY would prefer they exit through STORE B. Currently, there is a small letterboard that asks patrons to exit via the shop which is largely ineffective. Because of this, much of the foot traffic is being lost through the wrong exit. How might we nudge people to exit though the gift shop and bring the museum more revenue? We also observed various customer pain points. Although the museum offers a multitude of services, it still operates on a suggested donation model. What this means is that the museum suggests that every visitor gives 18 dollars for admission—however it is not required. Because the price of the ticket is somewhat of a moving target and variable by visitor, each individual visitor can determine what their willingness to pay would be for the ticket. That makes ticket revenue somewhat of an unstable source of cash flow to the museum. Tour bus companies specifically only give the museum 2-3 dollars per visitor from the tour bus. This means that the margins on these particular visitors are extremely low. When considering this, we note that because of the nature of the admission price, the majority or the revenue actually comes from donations, fundraising, and gift shop sales. The museum brings in a wide variety of visitors, including students, families, and general native New Yorkers. However, the tour bus tourists are the museum’s clearest opportunity group, totaling to one-third of the entire visitor pool. These tourists see the city via the double decker hop on hop off buses which travel through Manhattan. These tourists' demographic size has the potential to make a large impact on the revenue. For these reasons, we decided to make them the focus of our solutions. We wanted to consider the entirety of the user journey, including the time before and after the museum visit. Many of the users needs prior to the visit ultimately ended up driving some of our solutions. We chose a circular shape for the user journey because the path through the museum can be somewhat ambiguous. From the blueprint, we were able to establish opportunity points throughout the visitor's journey. From our interviews with museum staff, we were able to get a better sense of the back-end action and support systems necessary to keep the museum running. We were able to leverage these systems to address our challenge. Our main goal was to figure out how how to better integrate the shops with the overall museum experience in a more natural way. For our primary research, we conducted intercept and stakeholder interviews and went through a mystery shopping exercise. Through our research, we discovered four main principles to inform our work. We spoke with visitors and museum staff during operating hours. Our primary stakeholder, Jerry Gallagher, COO of the MCNY worked closely with us throughout our design process, offering up suggestions and steering us towards real pain points that they experience on a regular basis, affecting their revenue. We were able to walk around with Jerry and witness firsthand the pain points play out in real time and discuss potential ideas. After regrouping to ideate and discuss, we mapped out the museum visitors' major pain points and needs. From there, we came up with solutions while factoring in cost and feasibility. Did you go to the 1st museum shop? Yes. What did you buy? Oh, BUY? Museum shop? No we didn’t go into the gift shops at all. I thought you meant first floor exhibitions. We didn’t go into the gift shops at all. We did use the cafe. How did you find the exiting? Pretty easy. We didn't really notice the shops! To solve our problem, we came up with multiple approaches that optimize the holistic visitor experience for increased foot traffic towards Store B. 1: EXIT SOLUTION AKA "NOT-SO-GENTLE PERSUASION"
One solution, which we called ‘Not-So Gentle Persuasion’ covers the glass doors with large opaque decals with bold graphics which would more naturally direct the customers through the shop. The opacity would be a subtle way of changing customer behavior and more likely direct them to the gift shop exit. While the letter-board was subtle but ineffective, we instead thought of the opposite way of attracting attention and changing behavior. We thought of true New Yorkers, who are known for being brash, upfront, and funny. Why can't MCNY be equally upfront about their desire to make customers aware of the store that also happens to be an exit? 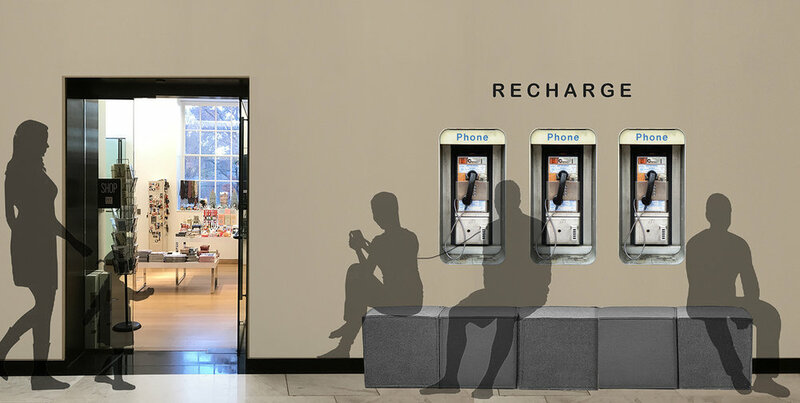 Across the atrium near the entrance of STORE B, we observed museum visitors charging their cell phones in a wall outlet. While waiting, they would recharge themselves by relaxing on the oversized ottoman near the base of the stairs. We saw this as a major opportunity to address some museum visitor needs - recharging their phones and bodies while traveling. To the north of the atrium is an expansive hallway filled with negative space. We thought this space could be better utilized as a recharge station. 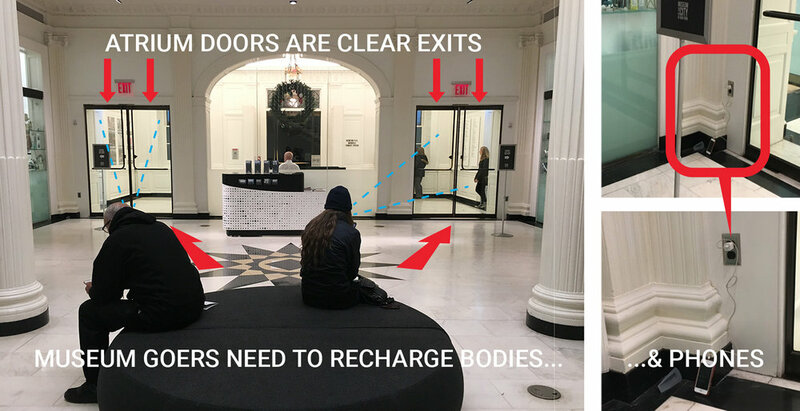 The close proximity to store B would mean that while museum visitors are recharging their bodies and phones, their companions and children would wander into the store, increasing the likelihood of a store purchase. An extremely lo-fidelity solution to a user need that could drive business into STORE B. Inspired by a relic of NYC history, we bring back the image of once ubiquitous vintage NYC phone booths, this time in decal form with USB chargers built-in. This encourages activity around STORE B as well as an Instagrammable moment. Verbal direction from museum staff can also potentially increase the foot traffic toward to the gift shops. Visitors interact with staff members at multiple touch points and these are great opportunities to have someone remind visitors to do certain things such as exit through the gift shops at the end of their visit. This solution is the most economical and easy to implement since the museum can just use their existing staff. However, it will require constant training and depend on the staff to maintain the solution. Our research shows that customers prefer to be led via a natural flow around a store rather than running into obstacles. We recommend a reconfiguration of STORE B's cash register location as well as general layout to be more conducive to a positive shopping experience. We see a major opportunity at the MCNY to capitalize on some of their best exhibits by producing specialized exhibit-related merchandise. Museum customers who are impacted by a well-curated experience or specific exhibits are more likely to purchase a reminder of the museum to take home with them. The MCNY delivers exhibit content with tremendous care and dynamic detail, yet most of the merchandise does not directly correlate to any of the exhibits. Our first merchandising suggestion would be to look at the Future City Lab exhibit. The table with the ‘WHAT IF’ cards is incredibly engaging with museum-goers writing their musings about an idealistic world on them. What if the MCNY held a contest each month for the best ‘WHAT IF’ card? The best designs could be printed on t-shirts, and the winners would get a free t-shirt along with a voucher to the cafe. The ‘WHAT IF’ graphic elements and bold colors lend themselves to merchandise easily. Creating specialized merchandise that can only be purchased at the MCNY makes the experience of shopping more unique. Margins are much healthier when you produce and sell directly. Customer who is positively engaged by the museum will be able to have a full-circle user journey taking home items that will directly remind them of the experience they had at the MCNY. Our sponsor reacted very enthusiastically to this engaging idea. Another approach to increasing foot traffic in the stores was to leverage store A as a touchpoint to give museum visitors a reason to return to store B. In store A, the merchandise is primarily books. STORE B revenue is much higher than STORE A. 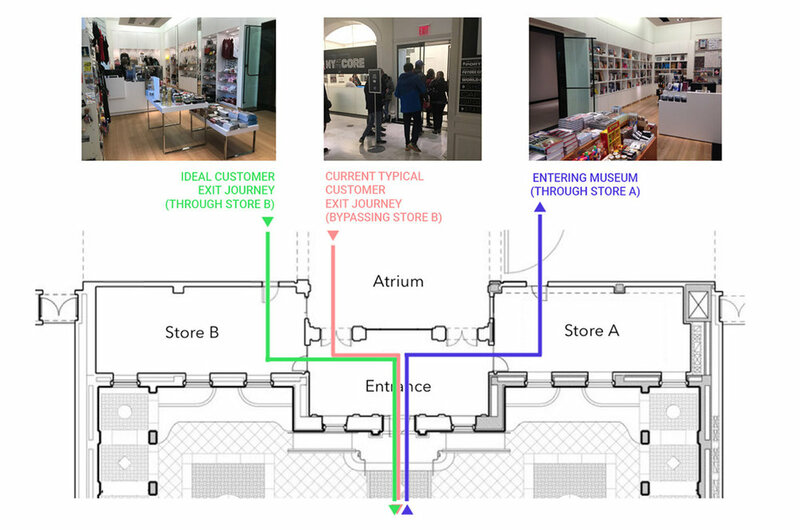 For the short term, we suggested the concept of “Buy Now, Pick Up Later.” In this model, a museum visitor can purchase a book or an object from store A, and then elect to leave it with the staff to pick up after their visit. That way, they are not only incentivized to enter store B to pick up their merchandise, but also more likely to buy something from store A since they do not need to carry it throughout the store. Based on the resources and availability of the museum store staff, they could even offer to ship an order to a person’s home, assuming they order a certain dollar amount of goods. This could further incentivize them to purchase things, so they do not need to carry the items throughout their trip. Following the design of our prototypes, we analyzed the economic feasibility of all of our ideas. On one end of the spectrum, ideas such as Buy Now, Pick Up Later and Verbal Directions from the Staff can be implemented at almost no cost to the museum, because the existing infrastructure and people necessary are already in place. However, these ideas require a high level of expertise on the Expertise - Industrialization scale and are high in human resource usage. On the opposite end of the spectrum, things such as the store interior display update are extremely high in upfront cost, but would essentially need staff to upkeep once implemented. 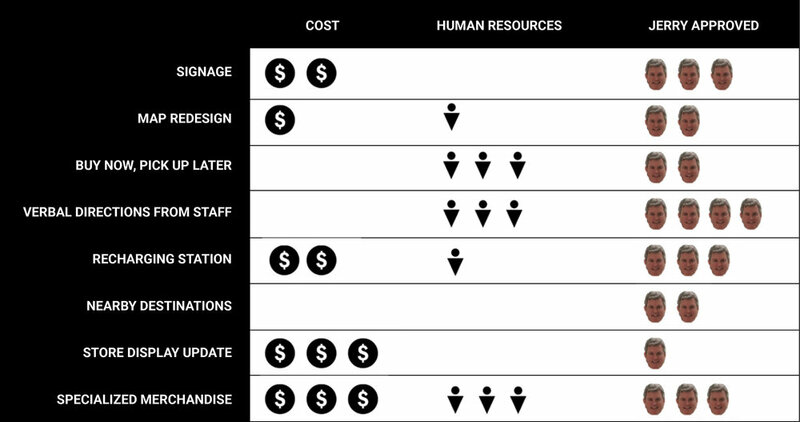 Similarly, changes in signage would not require human resources in the long run, and if anything would be able to lessen the load on staff with more clear signage and directions. Convince the MCNY to agree to prototype some of our ideas, namely the not-so-gentle-persuasion which we feel is a low cost low-fidelity easily implementable solution that could prove to be effective. Interview other key members of the MCNY team to get even more insight on pain points from their respective points of view and identify additional stakeholders. We did in fact speak with many of the staff members on the floor (the security guards, front desk staff selling tickets, cashiers, coat check staff) and we are happy to more prominently attribute our insights to these people. Conceptualize a solution in which we could think further “outside the box” of the stores? Does there even need to be two stores? If we minimize to one store, how might we utilize the second space in a different way? Build partnerships with other museums and local partners to increase MCNY’s visibility, bring in unique merchandise and eve sell MCNY merchandise outside the museum? Perhaps we could even build a local merchandise and artisan section from the museum’s Harlem neighborhood.